Under the deal, the top Chinese lithium producer will purchase SQM’s interest in the Cauchari-Olaroz brine project in Argentina for US$87.5 million in cash. Vancouver-based Lithium Americas (TSX:LAC,NYSE:LAC) has signed a strategic deal with Ganfeng Lithium (SZSE:002460) to further develop its Cauchari-Olaroz brine project in Argentina, the company announced on Monday (August 13). Under the deal, the top Chinese lithium producer will purchase SQM’s (NYSE:SQM) 50-percent interest in the project for US$87.5 million in cash plus a deferred payment of US$50 million after the project reaches production and certain agreed-upon milestones. The agreement will see the Canadian miner increase its interest in Cauchari-Olaroz from 50 percent to 62.5 percent, with Ganfeng holding the remaining 37.5 percent. The Chinese lithium miner will also provide Lithium Americas with a US$100-million loan, which Lithium Americas will use to pay its part in initial capital expenditures. “We share Lithium Americas’ goal to advance Caucharí-Olaroz to production as quickly as possible to further diversify and reduce the cost profile of our lithium resource portfolio,” said Ganfeng Lithium’s vice chairman, Wang Xiaoshen. “We believe many opportunities exist to enhance and grow the project for the mutual benefit of all stakeholders, including the local communities in Jujuy, Argentina, and look forward to working more closely with Lithium Americas going forward,” he added. The deal comes at time when demand for lithium for electric car batteries continues to grow and as Chinese companies look to invest in quality projects. In March, another Chinese top lithium producer, Tianqi Lithium (SZSE:002466), purchased a minority stake in SQM for US$4.07 billion. “I think the deal looks like a good strategic move for all parties,” Benchmark Mineral Intelligence Senior Analyst Andrew Miller said. “For SQM, it has been less critical to diversify their brine assets since resolving the situation with CORFO, and their focus will now be on expanding output in Chile and developing the joint venture (JV) with Kidman Resources (ASX:KDR),” he explained. Similarly, lithium expert Joe Lowry said the Ganfeng/Lithium Americas/SQM deal is a win-win-win agreement and a good deal for the industry as a whole. “LAC gets a great JV partner in Ganfeng who has deep financial pockets and the broadest lithium-processing ability in the industry, having worked with all the old ‘Big 3’ and many others,” Lowry said. “They converted brine from the Atacama into battery-quality lithium chemicals for over a decade in China. Of course, they have a long history processing hard rock from Talison and now converting spodumene from their own partly owned mine at Mount Marion into a variety of battery-quality chemicals,” the expert explained. For his part, Miller also said Ganfeng already has significant interest in hard-rock resources. “This diversifies their resources further into South American brine and gives them a holding in a high-quality asset,” he added. Meanwhile, analysts at VSA Capital Research in London said Ganfeng’s purchase is a vote of confidence in the lithium market. “The fact that Ganfeng Lithium is acquiring additional top tier lithium projects highlights to us that the demand outlook from China is far stronger than in the West and that lithium stocks are due a re-rating,” they said. The Cauchari-Olaroz brine project, which is located in Jujuy province, is still on track to start production in 2020. The stage-one development contemplates a production capacity of 25,000 metric tonnes per annum of lithium carbonate. “From a Lithium Americas perspective this partnership will help them accelerate their developments in Argentina and ensures they continue to have a strong partner with experience in conversion,” Miller said. After the news, Eight Capital analysts reiterated their “buy” recommendation for Lithium Americas. “We view these events as highly positive: both Lithium Americas and Ganfeng are wholly committed to the project and now LAC takes majority control of the project, while removing SQM’s foot dragging from the equation,” they added. The transaction is expected to be completed in the fourth quarter of the year. 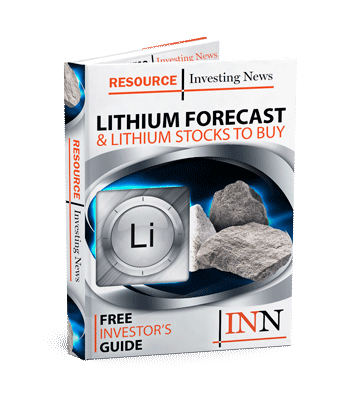 As of 1:00 p.m. EST on Tuesday (August 14), shares of Lithium Americas were up 19.1 percent in New York at US$4.24. Meanwhile, the company’s share price was up 18.8 percent in Toronto at C$5.56.